It's not everyday you see me discussing the Mac here, but sometimes an app hits the ballpark so remarkably I'm compelled to share its highlights. Fantastical 2 for iPhone was released on October 2013; the dedicated iPad version arrived almost 1 year ago – March 28 – and we've been eager for a newer Mac version ever since. Fantastical for Mac was still a superb application despite trailing behind the changes instituted by Yosemite and functionality from its iOS counterparts. Then Michael Simmons – co-founder of Flexibits, the company that makes Fantastical – asked on Twitter for the app's biggest fan, I [promptly made myself available](https://twitter.com/Pgruneich/status/575493790472929280 "Phillip Gruneich no Twitter: "@macguitar GIVE ME!" .") because I knew what he was talking about. When I opened the beta for Fantastical 2, I got dazzled by its beauty. 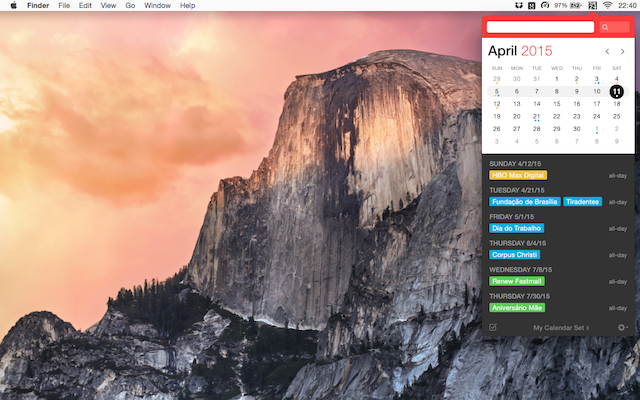 Fantastical 2 was restrained to the menubar no more, it became a full-blown calendar that put Apple's to shame. Everything about Fantastical 2 feels like Yosemite reached its peak, even while apps are still adapting tardily to the OS' concept. The speed, the interactions, the cues; Fantastical 2 for Mac elevates the platform onto a level I don't think even Apple considered possible. Fantastical for iOS empowers some of my favorite actions here and the previous Mac version was one of the first apps I acquired. I'm not a GTD example nor my agenda requires the sort of organization Fantastical provides, however the new version entices me to use my calendar further. 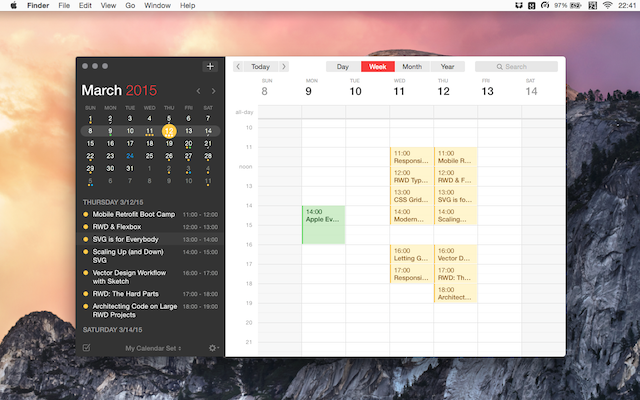 Fantastical 2 for Mac is the best calendar for the Mac and also the best app you can get on your Mac today; available in the App Store and the official site for introductory price of $39.99.